Dr. C.P. Kamboj's book on skill development written in Punjabi NTN published by Computer Vigyan Parkashan Fazilka launched on August 23, 2017 at Punjabi University. Dr. Kamboj's book titled "Punjabi Typing: NTN was launched by VC Dr. BS Ghuman. 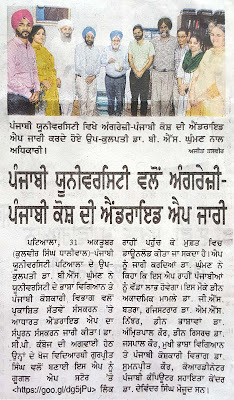 At this moment Dr. Inderjeet Singh Dean Academics, Dr. Manjeet Singh Nijhar, Dr. GS Batra Dean Research, Dr. Baljeet Singh Sidhu Finance Officer and Sh. Dharampal Garg Deputy Registrar were present. Dr. Ghuman said that, "This book be helpful for the rural youth to get employment" "University plans to introduce many skill development courses and this book can play an important role in this plan”, said VC Dr. Ghuman. 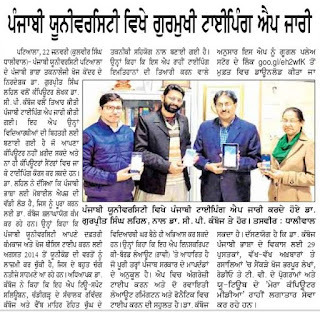 "Book has included the information regarding the basics of Computer & Internet, Punjabi Fonts, Keyboard layouts, Desktop compatibility, Punjabi Typing Techniques, Tricks & Tips, Preparation before Typing Tests and Punjabi Softwares," Said Dr. C.P. Kamboj. He said that the candidates those are preparing for SS Board typing exams can use this typing book for typing practice. He also said that the reader can login to www.cpkamboj.com to obtain more information regarding books and published articles. 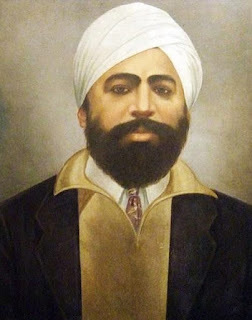 It is mentionable that Dr. Kamboj is a renowned author of Punjabi Computer literature. He has written more than 29 books. Many of his regular columns appear in leading Punjabi News Papers. In adition he regularly educates the people through FM Patiala, Doordarshan Jalandhar and You Tube channel.